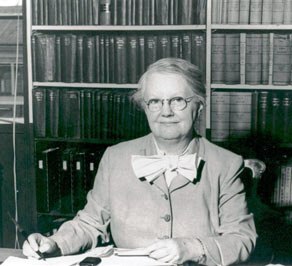 Margaret Cross Norton (1891-1984) was a groundbreaking archivist of public records, both as a woman and as an innovator and visionary. A graduate of the University of Chicago (bachelor’s and master’s degrees in history) and the New York Library School, Norton came to Springfield as Illinois state archivist in 1922. She held the post for 35 years, combining her background in history and library science to redefine the profession of archivist. She was a founder of the Society of American Archivists and served as its first vice president and later as president. The archivist profession was dominated by men. The fact that Norton “was so well accepted was due to her superior professional competence, her congenial personality, and her ability and willingness to do hard work,” according to a tribute posted on the web site of the Illinois Secretary of State’s office, which oversees the state archives. Norton’s early work, however, was literally down to earth. Melinda Fish Kwedar described some of the obstacles Norton faced in Unsung Heroines: A Salute to Springfield Women (1977). Because old records and documents had been kept haphazardly in unlikely and unrecorded places, an archivist needed to be something of a detective, Records had deteriorated in damp basements, and many were misleading. Under the steps of the Capitol she discovered enrolled laws. The first volume of the Governors’ Letter Book was recovered from a trash heap in a corner. At first a man with a gun protected her from rats, but later she carried a heavy lead pipe to scare them away. Following a fire that demolished the Illinois State Arsenal in 1934, destroying many military records in the process, Norton successfully lobbied the legislature to construct a building specifically designed to preserve records. Norton also was a prolific writer. Norton on Archives (1975) is a collection of her most significant articles. This entry was posted in Illinois capital, Prominent figures, State government, Women and tagged Capital Complex, Illinois State Arsenal. Bookmark the permalink.